Its flowers are large, with four spoon-shaped, solid colored, scarlet-red or orange-red petals and a fifth upright petal called the standard, which is slightly larger and is spotted with yellow and/or white. This absolute stunner goes by some other names as well. In Spanish, it is sometimes called the Arbol de Fuego – Tree of Fire. And in Mexico, Costa Rica and parts of Central America it is often referred to as Malinche. This was the name of an Indian girl who was said to be so beautiful that she persuaded Hernan Cortez to spare her people from extermination by his conquistadors. Metaphorically speaking, if you’d like to light a fire of bright color in your garden, this might be the tree for you! In fact, Robert Lee Riffle – whom I consider to have been the preeminent tropical botanist – wrote in his classic tome, “The Tropical Look”, “It is the world’s most beautiful flowering tree.” That just about properly sizes it up! 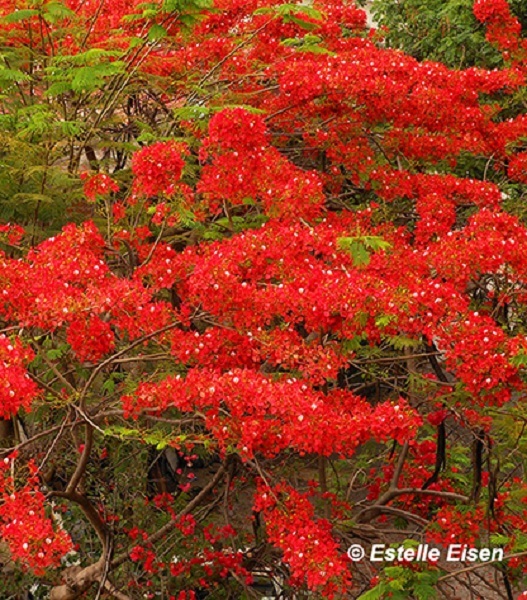 There are a dozen or so different trees called the Flame Tree with all of them being stunningly beautiful. Those most seen here in Mexico, are the Delonix regia which requires ample space and full sun to reach its umbrella-shaped (often wider than its height) mature stature of 18 meters. 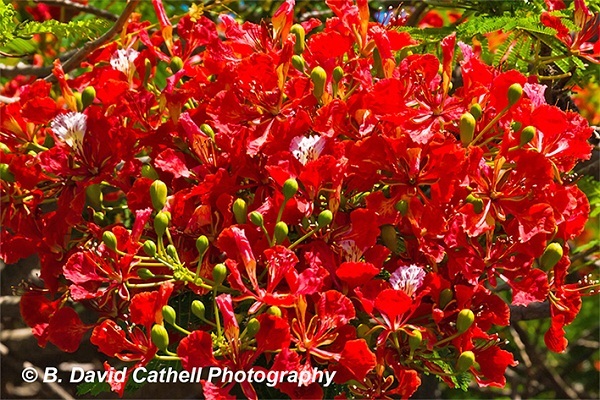 Well named, the riot of brilliant red flowers of the Flame Tree are a delight to see. The genus name is derived from the Greek words delos (meaning conspicuous), and onyx, meaning claw, referring to the appearance of the spectacular flowers. For those into genealogy, it is related to the Tamarind and Mimosa Tree! This spectacular, tropical, shade tree has a smooth, gray colored bark. Its feathery, fern-like leaves are evergreen if watered year around but will drop off if the tree becomes parched during the dry season. Appearing with its new leaves are masses of brilliantly vivid, five-petaled flowers that range from red / vermilion / orange / yellow to a pale apricot in color. As one of the most colorful trees in the world, the Flame Tree puts on a riotous floral show during a protracted spring and summer timeframe. These flowers are large, with four, spoon-shaped, solid colored, petals up to 8 cm long, and a fifth upright petal called the standard, which is slightly larger and is spotted with yellow and/or white. This tree flowers best in areas that have two distinct seasons. Following its blooms come long, flattened, leathery dark brown/black seed pods, 60 cm long and 5 cm wide. These seed pods are used in the Caribbean as a percussion instrument known as the “shak-shak” or maraca. Those noise-making, individual seeds inside these pods are small, weighing around 0.4 gram. Beyond noise, in these islands the pods are also, sometimes, used as fuel for fires. The compound, doubly pinnate leaves have a feathery appearance and are a characteristic light, bright green. Each leaf is 30-50 cm long and has 20 to 40 pairs of primary leaflets or pinnae on it, with each of these further divided into 10-20 pairs of secondary leaflets or pinnules. A malleable sort, this tree can tolerate aggressive pruning and be kept rather small. It is fast growing, at about 1½ meters (5 ft) per year, tolerant of a wide range of well drained soils, likes full sun and tolerates salty conditions. But it is best to provide protection from strong winds and they don’t like living on an openly exposed beach. If the tree does not receive regular and deep waterings, it forms large surface roots which, actually, only add to its attractiveness! 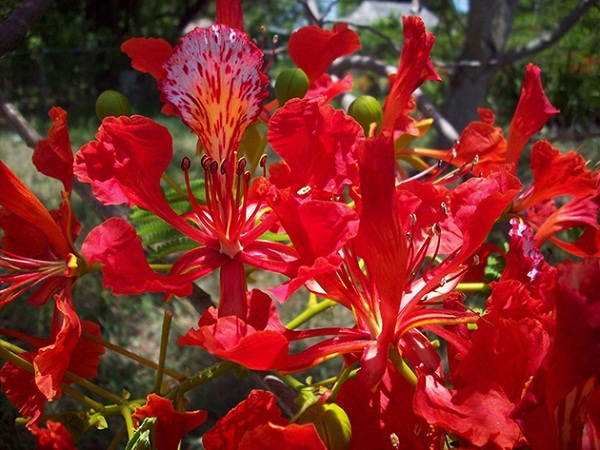 The native habitat of Delonix regia was, purportedly, unknown until the 1930s, when it was “rediscovered” in that land of so many magnificently different plants – the island nation of Madagascar. It is now widely grown throughout the Caribbean (where the locals simply call the tree “flamboyant”), Africa, the Canary Islands, Thailand, Taiwan, Hong Kong and in Southern China. 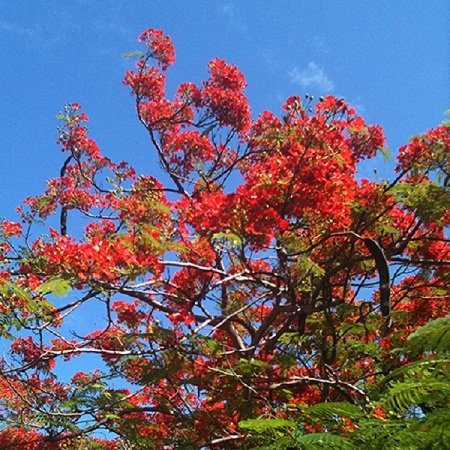 Because of the flower’s brilliance, and so many growing naturally in the area, the Puerto Rican town of Penuelas has been nicknamed “The Valley of the Flames”; in Vietnam, this tree is called “Phượng vỹ”, or Phoenix’s Tail; and in Miami there is an annual festival to celebrate the flowering of the Flame Tree. A few negatives are that as a result of its shallow, wide-spreading roots, underplantings generally do not work; its roots can cause problems for building foundations, walls and sidewalks; its large woody pods and brittle branches can get broken off in the wind; and the seedlings that come up around the tree base can be a bit of a nuisance – but I still like ‘em! So, in simple summation, if you’ve the space, this would make a superlative – and spectacular – addition to your gardens! Editor’s Note: This article was first published last year in our PVMirror City Paper Issue #244. We are republishing it for those who are new to PV and who have been admiring these beautiful trees in bloom around town. How do I purchase this beautiful tree?